Booking Fly Fishing Trips with Hawkins Outfitters is easy and quick. Call Hawkins Outfitters at 231-228-7135 . Please keep in mind that the more specific you are, the earlier you need to call and reserve you dates. Prime times are booked as much as a year in advance. Cherie (whom I’m told all the time is the greatest) will give you date options and let you know which guide she has assigned to your trip or if you’ve requested a guide whether or not he’s available. If not, Cherie will let you know who else we have or your preferred guide’s open dates. A credit card is required to confirm a reservation. The minimum deposit is $250 a day per guide reserved. We accept Visa or MasterCard but will not charge your card when you reserve the date. The deposit will be charged on your card immediately if you cancel 45 days or less from your scheduled fishing date. Your $250 deposit will be forfeited. If you fail to show up or cancel less than 48 hours from the date of your fly fishing trip, full payment will be charged to your card. You may pay the full amount due with cash or check at the end of the last day of your trip. All Visa and Mastercard charges will have a 5% processing fee added to the to the total. 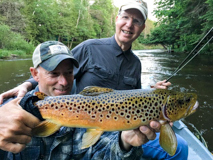 After you book your fly fishing trip you will receive an email confirmation outlining your guide and his contact information and links to information regarding equipment and lodging options. If you have any questions regarding your trip, timing, location etc. contact your guide as he is in charge of these decisions. Use of rods and reels, a quality lunch or dinner on the river, snacks and beverages and instruction by one of our award winning, fly fishing professionals if desired. Everything that is provided on a full day trip except the lunch or dinner. Items that are not included in the pricing: Michigan fishing license and personal items such as waders, rain gear, insect repellent, sunblock, etc. To inquire about availability of a specific date please Contact us here or call Cherie at 231-228-7135 . The more date specific you are the earlier you need to call. Due to the danger associated with flies in the air, all clients will be required to wear eye protection. Please bring your glasses/sunglasses! The Hawkins Group, Inc. D.B.A. Hawkins Outfitters assumes no liability for injury.